Sometimes I feel, well…old. Tired. Done. It usually happens when I catch my reflection somewhere and think, Who in the world is that? Or maybe I glance at my hands on the car’s steering wheel and get confused. Surely the rest of me doesn’t look that old! Regrettably, sometimes the whole visual thing seeps into my mind and heart and I’m tempted to just quit. What’s the point of learning, growing, striving? Maybe it’s time to put my feet up and let the world rush on by—just flip on the TV and put my brain on autopilot. Sometimes I feel, well…young. I have the urge to throw up my hands and sing at the top of my lungs. I want to dance. I want to throw my head back and laugh—long and loud—about nothing. I long to dream, to create, to start something new. I feel like I could do anything. I could get a running start and jump high and long (Well, actually I did this a couple of years ago with a group of 6th-graders and ended up tearing my ACL and needing surgery. But I made the jump. Just sayin’). Wow. Not even a mention of slacking off and giving up. We may feel a little dry and used up, but if we’re here and breathing, God still has plans and purpose for us. 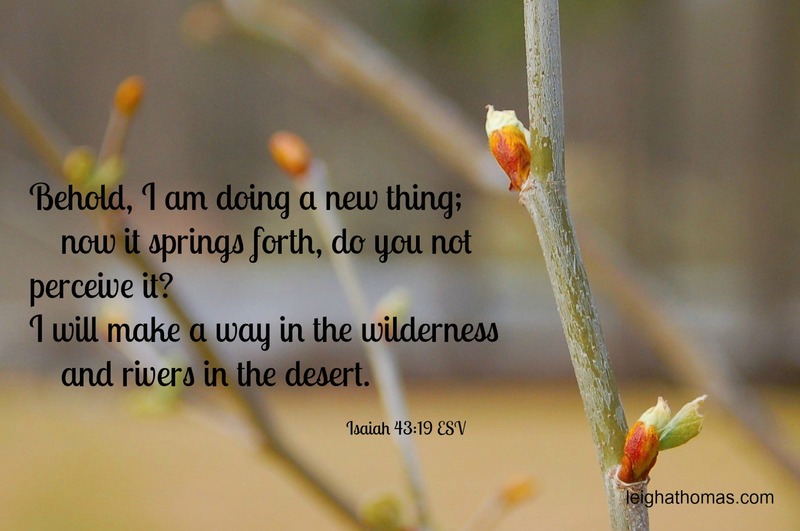 What “new thing” does God want to do in you?